A man picked randomly out of a crowd is made the target of CIA survelliance and pursuit. ‘Big’ stuff: How Penny Marshall saved Tom Hanks from a career slump … not just once but twice! A young couple struggles to repair a hopelessly dilapidated house. The equally-straight-laced and "by the book" nephew of Joe Friday must work with his more laid-back partner to solve a mystery. A Protestant World War II pilot and a Jewish girl fall in love in Jerusalem, even though their diverse backgrounds threaten to pull them apart. Reese: [slurringly] Do you have some aspirin? Q: Is this a remake of the 1972 french movie "Le Grand Blond avec une chaussure noire" ? Still a good spy spoof, and Oh, that dress! I'm a huge fan of Tom Hanks and I have collected almost all of his films (I can't get myself to buy Bonfire of the Vanities, however.) 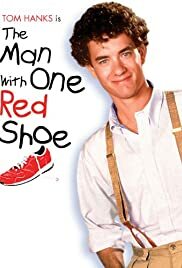 Seeing The Man with One Red Shoe again after 15 years, I still find it to be a pretty good spoof of the spy genre, perhaps even at times a little too uncomfortably close a portrayal of some of the shenanigans our intelligence services have gotten involved in from time to time. 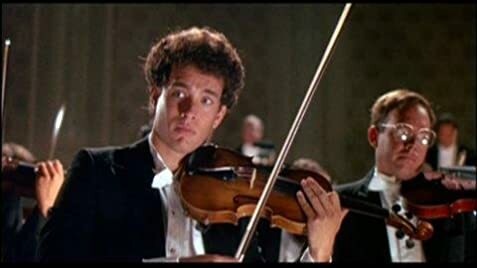 Tom Hanks is charming and funny, as he was in most of his films in the 1980s, but the script did not let him develop his character as much as in his next film, Nothing in Common. Dabney Coleman is also very funny as the "rogue spy." All that being said, however, the most memorable moment in the film has got to be when Lori Singer turns around and reveals the last word in "backless" evening gowns! That scene alone makes this movie a "must rental."